Collins was born on October 31, 1930, in Rome, Italy. He was the second son of James Lawton Collins, a career U.S. Army officer, who was the U.S. military attaché there from 1928 to 1932, and Virginia née Stewart. Collins had an older brother, James Lawton Collins Jr., and two older sisters, Virginia and Agnes. For the first 17 years of his life, Collins lived in many places as the Army posted his father to different locations: Rome; Oklahoma; Governors Island, New York; Fort Hoyle (near Baltimore, Maryland); Fort Hayes (near Columbus, Ohio); Puerto Rico; San Antonio, Texas; and Alexandria, Virginia. He took his first plane ride in Puerto Rico aboard a Grumman Widgeon; the pilot allowed him to fly it for a portion of the flight. He wanted to fly again, but since World War II started soon after, he was unable. Collins studied for two years in the Academia del Perpetuo Socorro in San Juan, Puerto Rico. After the United States entered World War II, the family moved to Washington, D.C., where Collins attended St. Albans School and graduated in 1948. His mother wanted him to enter into the diplomatic service, but he decided to follow his father, two uncles, brother and cousin into the armed services. He received an appointment to the United States Military Academy at West Point, from which his father and his older brother had graduated in 1907 and 1939 respectively. He graduated on June 3, 1952, with a Bachelor of Science degree, finishing 185th of 527 cadets in the class, which included future fellow astronaut Ed White. Collins' decision to join the United States Air Force (USAF) was motivated by both the wonder of what the next 50 years might bring in aeronautics, and to avoid accusations of nepotism had he joined the Army where his brother was already a colonel, his father had reached the rank of major general and his uncle, General J. Lawton Collins, was the Chief of Staff of the United States Army. The Air Force Academy was in its initial construction phase, and would not graduate its first class for several years. In the interim, graduates of the Military Academy were eligible for Air Force commissions. Promotion was slower in the Air Force than in the Army, due to the large number of young officers who had been commissioned and promoted during World War II. Collins commenced basic flight training in the T-6 Texan at Columbus Air Force Base in Columbus, Mississippi, in August 1952, then moved on to San Marcos Air Force Base in Texas to learn instrument and formation flying, and finally to James Connally Air Force Base in Waco, Texas, for training in jet aircraft. Flying came easily to him, and unlike many of his colleagues, he had little fear of failure. He was awarded his wings on completion of the course at Waco, and in September 1953, he was chosen for advanced day-fighter training at Nellis Air Force Base, Nevada, flying F-86 Sabres. The training was dangerous; eleven people were killed during accidents in the 22 weeks he was there. This was followed by an assignment in January 1954 to the 21st Fighter-Bomber Wing at George Air Force Base, California, where he learned ground attack and nuclear weapons delivery techniques in the F-86. He moved with the 21st when it was relocated to Chaumont-Semoutiers Air Base, France, in December 1954. He won first prize in a 1956 gunnery competition. During a NATO exercise that summer, he was forced to eject from an F-86 after a fire started aft of the cockpit. Collins met his future wife, Patricia Mary Finnegan from Boston, Massachusetts, in an officers' mess. A graduate of Emmanuel College, where she majored in English, she was a social worker, dealing mainly with single mothers. To see more of the world, she was working for the Air Force service club. After getting engaged, they had to overcome a difference in religion. Collins was nominally Episcopalian, while Finnegan came from a staunchly Roman Catholic family. After seeking permission to marry from Finnegan's father, and delaying their wedding when Collins was redeployed to West Germany during the 1956 Hungarian Revolution, they married in the summer of 1957. They had a daughter, actress Kate Collins, in 1959, a second daughter, Ann, in 1961 and a son, Michael, in 1963. After Collins returned to the United States in late 1957, he attended an aircraft maintenance officer course at Chanute Air Force Base, Illinois. He would later describe this school as "dismal" in his autobiography; he found the classwork boring, flying time scarce, and the equipment outdated. Upon completing the course, he commanded a Mobile Training Detachment (MTD) and traveled to air bases around the world. The detachment trained mechanics on the servicing of new aircraft, and pilots how to fly them. He later commanded a Field Training Detachment (FTD), which was a similar kind of unit, except that the students traveled to him. ARPS Class III graduates. Front row: Ed Givens, Tommie Benefield, Charles Bassett, Greg Neubeck and Collins. Back row: Al Atwell, Neil Garland, Jim Roman, Al Uhalt and Joe Engle. Collins' MTD posting allowed him to accumulate over 1,500 flying hours, the minimum required for admission to the USAF Experimental Flight Test Pilot School at Edwards Air Force Base, California. His application was successful, and on August 29, 1960, he became a member of Class 60C, which included Frank Borman, Jim Irwin and Tom Stafford, who later became astronauts. Military test pilot instruction started with the old T-28 Trojan, and proceeded through the high performance F-86, B-57 Canberra, T-33 Shooting Star, and the F-104 Starfighter. Collins was a heavy smoker, but decided to quit in 1962 after suffering a particularly bad hangover. The next day, he spent what he described as the worst four hours of his life in the co-pilot's seat of a B-52 Stratofortress while going through the initial stages of nicotine withdrawal. The inspiration for Collins in his decision to become a NASA astronaut was the Mercury Atlas 6 flight of John Glenn on February 20, 1962, and the thought of being able to circle the Earth in 90 minutes. Collins applied for the second group of astronauts that year. To raise the numbers of Air Force pilots selected, the Air Force sent their best applicants to a "charm school". Medical and psychiatric examinations at Brooks Air Force Base, Texas, and interviews at the Manned Spacecraft Center (MSC) in Houston, Texas followed. In mid-September he found out he had not been accepted. It was a blow even though he did not expect to be selected. Collins rated the second group of nine as better than the Mercury Seven that preceded them, or the five groups that followed, including his own. 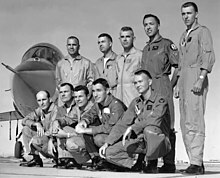 That year the USAF Experimental Flight Test Pilot School became the USAF Aerospace Research Pilot School (ARPS), as the Air Force tried to enter into space research through the X-15 and X-20 programs. Collins applied for a new postgraduate course offered into the basics of spaceflight. He was accepted into the third class on October 22, 1962. Other students in his eleven-member class included three future astronauts: Charles Bassett, Edward Givens and Joe Engle. Along with classwork, they also flew up to about 90,000 feet (27,000 m) in F-104 Starfighters. As they passed through the top of their arc, they would experience a brief period of weightlessness. On finishing this course he returned to fighter operations in May 1963. At the start of June of that year, NASA once again called for astronaut applications. Collins went through the same process as with his first application, though he did not take the psychiatric evaluation. He was at Randolph Air Force Base, Texas, on October 14 when Deke Slayton, the Chief of the Astronaut Office at NASA, called and asked if he was still interested in becoming an astronaut. Bassett was also accepted. By this time Collins had flown over 3,000 hours, of which 2,700 were in jet aircraft. Compared with the first two groups of astronauts, the third group of fourteen astronauts, which included Collins, was younger, with an average age of 31—the first two groups had an average age of 34.5 and 32.5 at their time of selection—and was better educated, with an average of 5.6 years of tertiary education; but they had fewer flying hours—2,300 on average compared with 3,500 and 2,800 for the first two groups, and only eight of the fourteen were test pilots. Of the thirty astronauts selected in the first three groups, only Collins and his third group colleague William Anders were born outside the United States, and Collins was the only one with an older brother; all the rest were the eldest or only sons in their families. Training began with a 240-hour course on the basics of spaceflight. Fifty-eight hours of this was devoted to geology, something that Collins did not readily understand and in which he never became very interested. At the end, Alan Shepard, the Chief of the Astronaut Office, asked the fourteen to rank their fellow astronauts in the order they would want to fly with them in space. Collins picked David Scott in the number one position. After this basic training, the third group were assigned specializations. Collins received his first choice: pressure suits and extravehicular activities (EVAs, also known as spacewalks). His job was to monitor the development and act as a liaison between the Astronaut Office and contractors. He was disturbed by the secretive planning of Ed White's EVA on Gemini 4, because he was not involved despite being the person with the greatest knowledge of the subject. In late June 1965, Collins received his first crew assignment: the backup pilot for Gemini 7, with his West Point classmate Ed White named as the backup mission commander. Collins was the first of the fourteen to receive a crew assignment, though would not be the first to fly; that honor went to Scott on Gemini 8, and Bassett was assigned to Gemini 9. Under the system of crew rotation established by Slayton, being on the backup crew of Gemini 7 set Collins up to become pilot of the Gemini 10 mission. Gemini 7 was commanded by Borman, whom Collins knew well from their days at Edwards, with Jim Lovell as the pilot. Collins made a point of providing a daily briefing to their wives, Susan Borman and Marilyn Lovell, on the progress of the two-week Gemini 7 mission. After the successful completion of Gemini 7, on January 24, 1966, Collins was assigned to the prime crew of Gemini 10, but with John Young as mission commander, as White moved on to the Apollo program. Jim Lovell and Buzz Aldrin were designated as the backup commander and pilot respectively. The arrangements were disturbed by the deaths of the Gemini 9 crew, Bassett and Elliot See, in the February 28, 1966 NASA T-38 crash. They were replaced on Gemini 9 by their backups, Stafford and Gene Cernan. Cernan thereby became the second of the fourteen to fly in space. Lovell and Aldrin became their backups, and Alan Bean and C. C. Williams took their place as the Gemini 10 backup crew. Collins would become the seventeenth American, and third member of his group, to fly in space. Training for Gemini 10 was interrupted in March when Slayton diverted Young, Collins and Williams to represent their respective services on a panel to select another group of astronauts, along with himself, Shepard, spacecraft designer Max Faget, and astronaut training officer Warren J. North. Young protested the loss of a week's training to no avail. Applying strict criteria for age, flying experience and education reduced the number of applicants to just 35. The panel interviewed each for an hour, and rated nineteen as qualified. Collins was surprised when Slayton elected to take them all. Slayton later admitted that he too had doubts; he already had enough astronauts for Project Apollo as far as the first Moon landing, but post-Apollo plans were for up to 30 missions. Such a large intake therefore seemed prudent. Ten of the nineteen had test pilot experience, and seven were graduates of the ARPS. Fifteen scientific experiments were carried on Gemini 10—more than any other Gemini mission except the two-week-long Gemini 7. After Gemini 9's EVA ran into problems, the remaining Gemini objectives had to be completed on the last three flights. While the overall number of objectives increased, the difficulty of Collins' EVA was scaled significantly back. There was no backpack or astronaut maneuvering unit (AMU), as there had been on Gemini 8. Their three-day mission called for them to rendezvous with two Agena Target Vehicles, undertake two EVAs, and perform 15 different experiments. The training went smoothly, as the crew learned the intricacies of orbital rendezvous, controlling the Agena and, for Collins, the EVA. For what was to be the fourth ever EVA, underwater training was not performed, mostly because Collins did not have the time. To train to use the nitrogen gun he would use for propulsion, a super smooth metal surface about the size of a boxing ring was set up. He would stand on a circular pad that used gas jets to raise itself off the surface. Using the nitrogen gun he would practice propelling himself across the "slippery table". Gemini 10 lifted off from Launch Complex 19 at Cape Canaveral at 05:20 local time on July 18, 1966. Upon reaching orbit, it was about 1,600 kilometers (990 mi) behind the Agena target vehicle, which had been launched 100 minutes earlier. 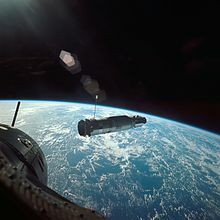 A rendezvous was achieved on Gemini 10's fourth orbit at 10:43, followed by docking at 11:13. The mission plan called for multiple dockings with the Agena target, but an error by Collins in using the sextant caused them to burn valuable propellant, resulting in Mission Control calling off this objective to conserve propellant. Once docked, the Agena 10 propulsion system was activated to boost the astronauts to a new altitude record, 764 kilometers (475 mi) above the Earth, breaking the previous record of 295 miles (475 km) set by Voskhod 2. A second burn of the Agena 10 engine at 03:58 on July 19 put them into the same orbit as Agena 8, which had been launched for the Gemini 8 mission on March 16. For his first EVA Collins did not leave the Gemini capsule, but stood up through the hatch with an ultraviolet camera. After he took the ultraviolet photos, Collins took photos of a plate they brought with them. They were used to compare photos taken in space with those taken in a laboratory. In his biography he said he felt at that moment like a Roman god riding the skies in his chariot. The EVA started on the dark side of the Earth so that Collins could take photos of the Milky Way. Collins' and Young's eyes began to water, forcing an early end to the EVA. Lithium hydroxide, which was normally used to remove exhaled carbon dioxide from the cabin, had accidentally been fed into the astronauts' space suits. The compressor causing the problem was switched off, and a high oxygen flow was used to purge the environmental control system. Prior to Collins' second EVA, the Agena 10 spacecraft was jettisoned. Young positioned the capsule close enough to Agena 8 for Collins to get to it while attached to his 49-foot (15 m) umbilical. Collins became the first person to perform two spacewalks in the same mission. He found it took much longer to complete tasks than he expected, something Cernan also experienced during his spacewalk on Gemini 9. He removed a micrometeorite experiment from the exterior of the spacecraft, and configured his nitrogen maneuvering thruster. Collins had difficulty reentering the spacecraft, and needed Young to pull him back in with the umbilical. The duo activated the retrorockets on their 43rd revolution, and they splashed down in the Atlantic at 04:06 on July 21, 3.5 miles (5.6 km) from the recovery vessel, the amphibious assault ship USS Guadalcanal, and were picked up by helicopter. Collins and Young completed nearly all of the major objectives of the flight. The docking practice and the landmark measurement experiment were not carried out in order to conserve propellant, and the micrometeorite collector was lost when it drifted out of the spacecraft. 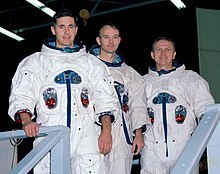 Shortly after Gemini 10, Collins was assigned to the backup crew for the second crewed Apollo flight, with Commander (CDR) Borman, Command Module Pilot (CMP) Stafford, and Collins as Lunar Module Pilot (LMP). Along with learning the new Apollo Command/Service Module (CSM) and the Apollo Lunar Module (LM), Collins received helicopter training, as these were thought to be the best way to simulate the landing approach of the LM. After the completion of Project Gemini, it was decided to cancel the Apollo 2 flight, since it would just repeat the Apollo 1 flight. Stafford was given his own crew, and Anders was assigned to Borman's crew. 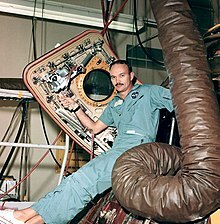 Slayton had decided that an Apollo mission commander should be an experienced astronaut who had already flown a mission, and that on flights with a LM, the CMP should also have some spaceflight experience, something Anders did not yet have, since the CMP would have to fly the CM alone. 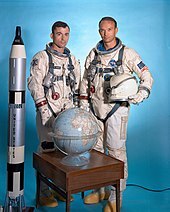 Collins was therefore moved to the CMP position on the Apollo 8 prime crew, and Anders became the LMP. The practice became that the CMP would be the next most senior member of the crew, and that they would go on to command later Apollo flights. Staff meetings were always held on Fridays in the Astronaut Office, and it was here that Collins found himself on January 27, 1967. Don Gregory was running the meeting in the absence of Shepard and so it was he who answered the red phone to be informed there was a fire in the Apollo 1 CM, and that the three astronauts, Gus Grissom, Ed White and Roger Chaffee were dead. When the enormity of the situation was ascertained, it fell on Collins to go to the Chaffee household to inform Martha Chaffee that her husband had died. The Astronaut Office had learned to be proactive in informing astronauts' families of a death quickly, because of the death of Theodore Freeman in an aircraft crash in 1964, when a newspaper reporter was the first to his house. Collins and Scott were sent by NASA to the Paris Air Show in May 1967. There they met cosmonauts Pavel Belyayev and Konstantin Feoktistov, with whom they drank vodka on the Soviets' Tupolev Tu-134. Collins found it interesting that some cosmonauts were doing helicopter training like their American counterparts, and Belyayev said that he hoped to make a circumlunar flight soon. The astronauts' wives had accompanied them on the trip, and Collins and his wife Pat were compelled by NASA and their friends to travel to Metz where they had been married ten years before. There, they found a third wedding ceremony had been arranged for them (ten years previously they had already had civil and religious ceremonies), so they could renew their vows. During 1968, Collins noticed that his legs were not working as they should, first during handball games, then as he walked down stairs. His knee would almost give way, and his left leg had unusual sensations when in hot and cold water. Reluctantly he sought medical advice and the diagnosis was a cervical disc herniation, requiring two vertebrae to be fused together. The surgery was performed at Wilford Hall Hospital at Lackland Air Force Base, Texas. The planned recuperation time was three to six months. He spent three months in a neck brace. As a result, Collins was removed from the prime crew of Apollo 9 and his backup, Jim Lovell, replaced him as CMP. When the Apollo 8 mission was changed from a CSM/LM mission in high Earth orbit to a CSM-only flight around the Moon, both prime and backup crews for Apollo 8 and 9 swapped places. Having trained for the flight, Collins was made a capsule communicator (CAPCOM), an astronaut stationed at Mission Control responsible for communicating directly with the crew during a mission. As part of the Green Team, he covered the launch phase up to translunar injection, the rocket burn that sent Apollo 8 to the Moon. The successful completion of the first crewed circumlunar flight was followed by the announcement of the Apollo 11 crew of Armstrong, Aldrin, and Collins. At that time, in January 1969, it was not certain this would be the lunar landing mission; this depended on the success of Apollo 9 and Apollo 10 testing the LM. As CMP, Collins' training was completely different from the LM and lunar EVA, and was sometimes done without Armstrong or Aldrin being present. Along with simulators, there were measurements for pressure suits, centrifuge training to simulate the 10 g reentry, and practicing docking with a huge rig at NASA Langley Research Center, Hampton, Virginia. Since he would be the active participant in the rendezvous with the LM, Collins compiled a book of 18 different rendezvous schemes for various scenarios including ones where the LM did not land, or it launched too early or too late. This book ran for 117 pages. The famous mission patch of Apollo 11 was the creation of Collins. Jim Lovell, the backup commander, mentioned the idea of eagles, a symbol of the United States. Collins liked the idea and found a painting by artist Walter A. Weber in a National Geographic Society book, Water, Prey, and Game Birds of North America, traced it and added the lunar surface below and Earth in the background. The idea of an olive branch, a symbol of peace, came from a computer expert at the simulators. The call sign Columbia for the CSM came from Julian Scheer, the NASA Assistant Administrator for Public Affairs. He mentioned the idea to Collins in a conversation and Collins could not think of anything better. 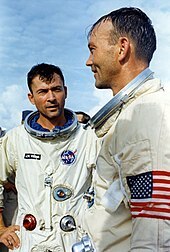 During the training for Apollo 11, Slayton offered to get Collins back into the crew sequence after the flight. Collins would almost certainly have been the backup commander of Apollo 14, followed by commander of Apollo 17, but he told Slayton he did not want to travel to space again if Apollo 11 was successful. The strenuous schedule of an astronaut strained his family life. He wanted to help achieve John F. Kennedy's goal of landing on the Moon within the decade and had no interest in further exploration of the Moon once the goal had been achieved. The assignment was given to Cernan. An estimated one million spectators watched the launch of Apollo 11 from the highways and beaches in the vicinity of the launch site. The launch was televised live in 33 countries, with an estimated 25 million viewers in the United States alone. Millions more listened to radio broadcasts. Propelled by a giant Saturn V rocket, Apollo 11 lifted off from Launch Complex 39A at the Kennedy Space Center on July 16, 1969, at 13:32 UTC (09:32 EDT), and entered Earth orbit twelve minutes later. After one and a half orbits, the S-IVB third-stage engine pushed the spacecraft onto its trajectory toward the Moon. About 30 minutes later, Collins performed the transposition, docking, and extraction maneuver. This involved separating Columbia from the spent S-IVB stage, turning around, and docking with Eagle. After it was extracted, the combined spacecraft headed for the Moon, while the rocket stage flew on a trajectory past it. On July 19 at 17:21:50 UTC, Apollo 11 passed behind the Moon and fired its service propulsion engine to enter lunar orbit. 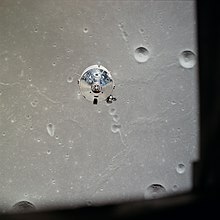 In the thirty orbits that followed, the crew saw passing views of their landing site in the southern Sea of Tranquillity about 12 miles (19 km) southwest of the crater Sabine D. At 12:52:00 UTC on July 20, Aldrin and Armstrong entered Eagle and began the final preparations for lunar descent. At 17:44:00 Eagle separated from Columbia. Collins, alone aboard Columbia, inspected Eagle as it pirouetted before him to ensure the craft was not damaged and that the landing gear was correctly deployed before heading for the surface. During his day flying solo around the Moon, Collins never felt lonely. Although it has been said "not since Adam has any human known such solitude", Collins felt very much a part of the mission. In his autobiography he wrote "this venture has been structured for three men, and I consider my third to be as necessary as either of the other two". During the 48 minutes of each orbit he was out of radio contact with Earth; the feeling he reported was not loneliness, but rather "awareness, anticipation, satisfaction, confidence, almost exultation". One of Collins' first tasks was to identify the lunar module on the ground. To give Collins an idea where to look, Mission Control radioed that they believed the lunar module landed about four miles off target. Each time he passed over the suspected lunar landing site, he tried in vain to find the lunar module. On his first two orbits on the far side of the Moon, Collins performed maintenance activities such as dumping excess water produced by the fuel cells and preparing the cabin for Armstrong and Aldrin to return. "Spacecraft 107 — alias Apollo 11 — alias Columbia. The best ship to come down the line. God Bless Her. Michael Collins, CMP"
In a July 2009 interview with The Guardian, Collins revealed that he was very worried about Armstrong and Aldrin's safety. He was also concerned in the event of their deaths on the Moon, he would be forced to return to Earth alone and, as the mission's sole survivor, be regarded as "a marked man for life". At 17:54 UTC on July 21, Eagle lifted off from the Moon to rejoin Collins aboard Columbia in lunar orbit. After rendezvous with Columbia, the ascent stage was jettisoned into lunar orbit, and Columbia made its way back to Earth. Columbia splashed down in the Pacific 2,660 km (1,440 nmi) east of Wake Island at 16:50 UTC (05:50 local time) on July 24. The total mission duration was eight days, three hours, 18 minutes, and thirty-five seconds. Divers passed biological isolation garments (BIGs) to the astronauts, and assisted them into the life raft. Though the chance of bringing back pathogens from the lunar surface was believed to be remote, it was still considered a possibility. The astronauts were winched on board the recovery helicopter, and flown to the aircraft carrier USS Hornet, where they spent the first part of the Earth-based portion of 21 days of quarantine (time in space was also counted) before moving on to Houston. On August 13, the three astronauts rode in parades in their honor in New York and Chicago, with about six million attendees. On the same evening in Los Angeles there was an official state dinner to celebrate the flight, attended by members of Congress, 44 governors, the Chief Justice of the United States, and ambassadors from 83 nations at the Century Plaza Hotel. In September, the astronauts embarked on a 38-day world tour that brought them to 22 foreign countries and included visits with prominent world leaders. NASA Administrator Thomas O. Paine told Collins that Secretary of State William P. Rogers was interested in appointing Collins to the position of Assistant Secretary of State for Public Affairs. After the crew returned to the U.S. in November, Collins sat down with Rogers and accepted the position on the urgings of President Richard Nixon. He was an unusual choice for the role, as he was neither a journalist nor a career diplomat. Nor, unlike some of his predecessors, did he act as the department spokesperson. Instead, as the head of the State Department's Bureau of Public Affairs, his role was that of managing relations with the public at large. He had a staff of 115 and a budget of $2.5 million, but this was small compared with the 6,000 public affairs staff at the United States Department of Defense. Collins took over at a very difficult time. The Vietnam War was going badly, and the invasion of Cambodia and the Kent State shootings had triggered a wave of protests and unrest across the country. He had no illusions about his ability to change minds, but attempted to engage with the public all the same, playing on his Apollo 11 fame. He attributed part of the nation's problems to insularity. In a 1970 commencement speech at Saint Michael's College in Vermont, he told his audience that "Farmers speak to farmers, students to students, business leaders to other business leaders, but this intramural talk serves mainly to mirror one's beliefs, to reinforce existing prejudices, to lock out opposing views". Eventually, Collins came to realize that he was not enjoying the job, and when an opportunity arose that was a better fit for his skills, he secured President Nixon's permission to become the Director of the National Air and Space Museum. His departure was officially announced on February 22, 1971. He worked in that role until April 11, 1971. The position remained vacant until Carol Laise replaced him in October 1973. On August 12, 1946, Congress passed an authorization bill for a National Air Museum, to be administered by the Smithsonian Institution, and located on the National Mall in Washington, D.C.. Under the U.S. legislative system, authorization is insufficient; Congress also has to pass an appropriation bill allocating funding. Since this was not done, there was no money for the museum building. The Milestones of Flight Hall of the National Air and Space Museum in Washington, D.C. The 1957 Sputnik crisis and the resulting Space Race led to a surge of public interest in space exploration. The Freedom 7 and Friendship 7 Project Mercury spacecraft were donated to the Smithsonian, and 2,670,000 visitors descended on the Arts and Industries Building when they were put on display in 1963. The museum was renamed the National Air and Space Museum in 1966, but there was still no funding to build it. Apollo 11 created another surge of interest in space. An exhibition of a Moon rock attracted 200,000 visitors in one month. On May 19, 1970, Senator Barry Goldwater, a retired USAF major general, gave an impassioned speech in the Senate for funding of a museum building. This was the sort of challenge that Collins was well-suited for and relished. His background as an astronaut and an air force officer made him a good fit. Moreover, the job had a clearly defined and tangible goal: to obtain Congressional funding, and to build the museum. Collins lobbied hard for the new museum. With the help of Goldwater in particular, Congress relented, and on August 10, 1972, approved $13 million and contract authority of $27 million for its construction. The $40 million budget was lower than he had hoped for, and the building had to be scaled back and some economies made. In addition to cost pressure, there was also severe time pressure, as the museum was scheduled to open on July 4, 1976 as part of celebrations of the upcoming United States Bicentennial. The design by architect Gyo Obata of the St. Louis firm Hellmuth Obata & Kassabaumof aimed to harmonize the new museum with the other ones on the National Mall, so the exteriors were faced with Tennessee marble to match the façade of the National Gallery of Art. Gilbane Building Company was awarded the construction contract. Everything was fast-tracked. Contracts were awarded as soon as each component of the design was complete. This allowed the first contract to be awarded within five months of the start of design. The design was completed in just nine months, and all contracts were awarded within a year of the start of design. Ground was broken on the new museum on November 20, 1972. The building was built horizontally rather than vertically, as is the norm, so that work on the interiors could proceed concurrently. Overseeing construction was but a part of Collins' task: he also had to hire museum staff, oversee the creation of exhibits, and launch the Museum's Center for Earth and Planetary Studies, a new division devoted to research and analysis of lunar and planetary spacecraft data. Collins described the project as "a monumental effort" in which "individual creativity combined with dedicated teamwork and plain hard work". The museum was completed on budget, and opened three days ahead of schedule on July 1, 1976. President Gerald Ford presided over the formal opening ceremony. Over one million visitors passed through its doors in the first month, and it quickly established itself as one of the world's most popular museums, averaging between eight and nine million visitors per annum over the next two decades. Visitors entering saw Columbia in the Milestones of Flight Hall, along with the Wright Flyer, the Spirit of St. Louis and Glamorous Glennis. Collins held the directorship until 1978, when he stepped down to become undersecretary of the Smithsonian Institution. During this time, although no longer an active-duty USAF officer after he joined the State Department in 1970, he remained in the U.S. Air Force Reserves. He attained the rank of major general in 1976, and retired in 1982. 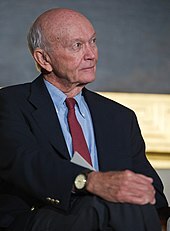 Collins completed the Harvard Business School's Advanced Management Program in 1974, and in 1980 became Vice President of LTV Aerospace in Arlington, Virginia. He resigned in 1985 to start his own consulting firm, Michael Collins Associates. He wrote an autobiography in 1974 entitled Carrying the Fire: An Astronaut's Journeys. The New York Times writer John Wilford wrote that it is "generally regarded as the best account of what it is like to be an astronaut." Collins has also written Liftoff: The Story of America's Adventure in Space (1988), a history of the American space program, Mission to Mars (1990), a non-fiction book on human spaceflight to Mars, and Flying to the Moon and Other Strange Places (1976), revised and re-released as Flying to the Moon: An Astronaut's Story (1994), a children's book on his experiences. Along with his writing, he has painted watercolors, mostly of the Florida Everglades or aircraft that he flew; they are rarely space-related. He did not initially sign his paintings to avoid them increasing in price just because they had his autograph on them. He lived with his wife, Pat, in Marco Island, Florida and Avon, North Carolina until her death in April 2014. Collins was a long-time trustee of the National Geographic Society and presently serves as Trustee Emeritus. He is also a fellow of the Society of Experimental Test Pilots and the American Institute of Aeronautics and Astronautics. Collins was inducted into four halls of fame: the International Air & Space Hall of Fame (1971), the International Space Hall of Fame (1977), the U.S. Astronaut Hall of Fame (1993), and the National Aviation Hall of Fame (1985). In 2008 he was inducted into the Aerospace Walk of Honor in Lancaster, California. The International Astronomical Union honored him by naming an asteroid after him, 6471 Collins. Also, like the other two Apollo 11 crew members, he has a lunar crater named after him. Collins was awarded the Air Force Distinguished Flying Cross in 1966 for his work in the Gemini Project. He was also awarded Air Force Command Pilot Astronaut Wings. Deputy NASA Administrator Robert Seamans pinned the NASA Exceptional Service Medal on Collins and Young in 1966 for their role in the Gemini 10 mission. For the Apollo Project, he was awarded the Air Force Distinguished Service Medal, and the NASA Distinguished Service Medal. He was awarded the Legion of Merit in 1977. Along with the rest of the Apollo 11 crew, he was awarded the Presidential Medal of Freedom with Distinction by President Nixon in 1969 at the state dinner in their honor. The three were awarded the Collier Trophy and the General Thomas D. White USAF Space Trophy in 1969. The National Aeronautic Association president awarded a duplicate trophy to Collins and Aldrin at a ceremony. The trio received the international Harmon Trophy for aviators in 1970, conferred to them by Vice President Spiro Agnew in 1971. Agnew also presented them the Hubbard Medal of the National Geographic Society in 1970. He told them, "You've won a place alongside Christopher Columbus in American history". Collins also received the Iven C. Kincheloe Award from the Society of Experimental Test Pilots (SETP) in 1970. In 1989, some of his personal papers were transferred to Virginia Polytechnic Institute and State University. In 1999, while celebrating the 30th anniversary of the lunar landing, Vice President Al Gore, who was also the vice chancellor of the Smithsonian Institution's Board of Regents, presented the Apollo 11 crew with the Smithsonian's Langley Gold Medal for aviation. After the ceremony, the crew went to the White House and presented President Bill Clinton with an encased Moon rock. The crew was awarded the New Frontier Congressional Gold Medal in the Capitol Rotunda in 2011. It is the highest civilian award that can be received in the United States. 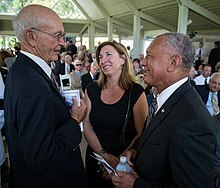 During the ceremony, NASA administrator Charles Bolden said, "Those of us who have had the privilege to fly in space followed the trail they forged." 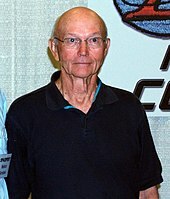 Collins is one of the astronauts featured in the 2007 documentary In the Shadow of the Moon. He had a small part as "Old Man" in the 2009 movie, Youth in Revolt. In the 1996 TV movie Apollo 11, he was played by Jim Metzler, and in the 1998 HBO miniseries From the Earth to the Moon, he was played by Cary Elwes. In the 2009 TV movie Moon Shot, he was played by Andrew Lincoln. In the 2018 film First Man, he was portrayed by Lukas Haas, and he is featured in the 2019 documentary film Apollo 11. For contributions to the television industry, the Apollo 11 astronauts were honored with round plaques on the Hollywood Walk of Fame. English rock group Jethro Tull recorded a song "For Michael Collins, Jeffrey and Me", which appears on the Benefit album from 1970. The song compares the feelings of misfitting from vocalist Ian Anderson (and friend Jeffrey Hammond) with the astronaut's own, as he is left behind by the ones who had the privilege of walking on the surface of the Moon. In 2013, indie pop group The Boy Least Likely To released the song "Michael Collins" on the album The Great Perhaps. The song uses Collins' feeling that he was blessed to have the type of solitude of being truly separated from all other human contact in contrast with modern society's lack of perspective. American folk artist John Craigie recorded a song titled "Michael Collins" for his 2017 album No Rain, No Rose. The song embraces his role as an integral part of the Apollo 11 mission with the chorus, "Sometimes you take the fame, sometimes you sit back stage, but if it weren't for me them boys would still be there." Collins, Michael (1974). Carrying the Fire: An Astronaut's Journeys. New York: Farrar, Straus, and Giroux. Collins, Michael (1976). Flying to the Moon and Other Strange Places. New York: Farrar, Straus and Giroux. Collins, Michael (1988). Liftoff: The Story of America's Adventure in Space. Illustrated by James Dean. New York: Grove Press. Collins, Michael (1990). Mission to Mars. New York: Grove Weidenfeld. ^ a b "Michael Collins". Astronaut Scholarship Foundation. Archived from the original on February 28, 2018. Retrieved March 1, 2018. ^ "Astronaut Fact Book" (PDF). NASA. April 2013. Archived (PDF) from the original on August 29, 2017. Retrieved April 18, 2018. ^ a b c d e Hansen 2005, pp. 344–345. ^ Cullum 1940, p. 197. ^ Barnes, Bart (May 12, 2002). "James Collins Jr., 84; General, Military Historian". Los Angeles Times. Archived from the original on August 28, 2015. Retrieved October 5, 2018. ^ a b Cullum 1950, p. 986. ^ Collins 1994, p. 12. ^ San Juan's Young King Who Climbed to the Moon. 1969 Congressional Record, Vol. 115, Pages H25639-H25640 (September 16, 1969). Retrieved November 26, 2015. ^ Bonner, Alice (May 10, 1977). "Ferdinand Ruge, St. Albans English Master, Dies". The Washington Post. Archived from the original on April 30, 2018. Retrieved April 11, 2018. ^ a b c Cullum 1960, p. 605. ^ a b Collins 2001, pp. 7–8. ^ Patrick, Bethany Kelly. "Air Force Col. Michael Collins". Military.com. Archived from the original on May 3, 2018. Retrieved May 3, 2018. ^ a b Collins 2001, pp. 8–9. ^ Barbree 2014, p. 184. ^ Hansen 2005, pp. 346–347. ^ Chaikin 2007, p. 599. ^ Collins 2001, p. 43. ^ Collins 2001, pp. 11–12. ^ "1998 Distinguished Graduate Award". West Point Association of Graduates. Archived from the original on March 4, 2018. Retrieved March 3, 2018. ^ Collins 2001, pp. 13–17. ^ Burgess 2013, p. 118. ^ Collins 2001, pp. 153–155. ^ Collins 2001, pp. 25–33. ^ Hansen 2005, p. 347. ^ Burgess 2013, pp. 18–19. ^ Collins 2001, pp. 34–40. ^ Collins 2001, pp. 40–46. ^ Burgess 2013, p. 288. ^ Collins 2001, p. 45. ^ Burgess 2013, p. 293. ^ Sherrod 1975, p. 152. ^ Collins 2001, pp. 72–73. ^ Collins 2001, p. 77. ^ Collins 2001, p. 110. ^ Collins 2001, pp. 113–115. ^ Collins 2001, pp. 139–140. ^ Reichl 2016, p. 91. ^ Collins 2001, pp. 141–142. ^ "NASA Gemini VIII First Docking Turns To Wild Ride in Orbit, Quickly Became In-Flight Emergency". Space Coast Daily. February 17, 2017. Archived from the original on April 17, 2018. Retrieved April 17, 2018. ^ a b Collins 2001, pp. 166–167. ^ Collins 2001, pp. 142–143. ^ Collins 2001, p. 163. ^ a b Reichl 2016, p. 123. ^ Collins 2001, p. 174. ^ Collins 2001, pp. 176–177. ^ Collins 2001, p. 251. ^ Collins 2001, pp. 177–181. ^ Shayler & Burgess 2017, pp. 18–19. ^ Slayton & Cassutt 1994, pp. 171–173. ^ Collins 2001, p. 173. ^ Collins 2001, pp. 177–198. ^ a b c d "Gemini 10 – NSSDCA/COSPAR ID: 1966-066A". NASA. Retrieved December 20, 2018. ^ Hacker & Grimwood 2010, pp. 341–344]. ^ Reichl 2016, p. 125. ^ Reichl 2016, p. 126. ^ Collins 2001, pp. 219–222. ^ Collins 2001, pp. 221, 475. ^ Reichl 2016, p. 127. ^ Slayton & Cassutt 1994, p. 178. ^ a b c Reichl 2016, pp. 127–129. ^ Evans 2010, p. 151. ^ Shayler 2004, Appendix 1. ^ "Astronauts splash down safely; mission proves much yet to be learned in space". Palladium-Item. Richmond, Indiana. July 22, 1966. p. 11. Archived from the original on April 12, 2018. Retrieved April 11, 2018 – via Newspapers.com. ^ Collins 2001, pp. 267–268. ^ a b Shayler & Burgess 2017, p. 274. ^ Collins 2001, pp. 269–274. ^ Collins 2001, pp. 278–282. ^ Skipper, Ben (July 20, 2014). "Moon Landing 45th Anniversary: Who Is Michael Collins The Forgotten Astronaut?". International Business Times. Archived from the original on April 27, 2018. Retrieved April 27, 2018. ^ "Astronaut Gets Out of Hospital". Abilene Reporter-News. Abilene, Texas. Associated Press. July 31, 1968. p. 46. Archived from the original on April 11, 2018. Retrieved April 11, 2018 – via Newspapers.com. ^ Ertel, Ivan D.; Newkirk, Roland W.; et al. (1969–1978). "Appendix 6: Crews and Support for Manned Apollo Flights". The Apollo Spacecraft: A Chronology. IV. Compiled by Sally D. Gates, History Office, JSC, with Cyril E. Baker, Astronaut Office, JSC. Washington, D.C.: NASA. LCCN 69060008. OCLC 23818. NASA SP-4009. Archived from the original on February 5, 2008. Retrieved January 29, 2008. ^ "Day 1: The Green Team and Separation". Apollo Flight Journal. NASA. Archived from the original on December 25, 2017. Retrieved April 27, 2018. ^ Collins 2001, pp. 312–314. ^ a b Collins 2001, p. 339. ^ "The Making of the Apollo 11 Mission Patch". NASA. July 14, 2016. Archived from the original on April 19, 2018. Retrieved February 28, 2018. ^ Hansen 2005, pp. 325–332. ^ Collins 2001, pp. 332–334. ^ Collins 2001, pp. 342–343. ^ Slayton & Cassutt 1994, pp. 237–238. ^ Loff, Sarah (December 21, 2017). "Apollo 11 Mission Overview". NASA. Archived from the original on February 9, 2018. Retrieved January 4, 2019. ^ a b c d e Orloff 2000, pp. 102–110. ^ "Apollo-11 (27)". Historical Archive for Manned Missions. NASA. Archived from the original on May 26, 2013. Retrieved June 13, 2013. ^ "Apollo 11 Lunar Landing Mission" (PDF) (Press kit). Washington, D.C.: NASA. July 6, 1969. Release No: 69-83K. Archived (PDF) from the original on August 11, 2013. Retrieved June 13, 2013. ^ "July 24 Mission Logs". NASA. July 21, 1969. Archived from the original on October 8, 2012. Retrieved April 27, 2012. ^ Collins 2001, p. 402. ^ "Michael Collins' Inscription inside Apollo 11 Command Module "Columbia"". Smithsonian National Air and Space Museum. Archived from the original on April 28, 2018. Retrieved April 27, 2018. ^ McKie, Robin (July 19, 2009). "How Michael Collins became the forgotten astronaut of Apollo 11". The Guardian. London. Archived from the original on September 6, 2013. Retrieved May 12, 2010. ^ Woods, W. David; MacTaggart, Kenneth D.; O'Brien, Frank (eds.). "Day 9: Re-entry and Splashdown". Apollo 11 Flight Journal. NASA. Archived from the original on December 25, 2017. Retrieved September 27, 2018. ^ a b c "Richard Nixon: Remarks at a Dinner in Los Angeles Honoring the Apollo 11 Astronauts". The American Presidency Project. August 13, 1969. Archived from the original on September 2, 2018. Retrieved October 24, 2017. ^ "President Offers Toast to 'Three Brave Men'". The Evening Sun. Baltimore, Maryland. Associated Press. August 14, 1969. p. 1. Retrieved March 20, 2019 – via Newspapers.com. ^ Smith, Merriman (August 14, 1969). "Astronauts Awed by the Acclaim". The Honolulu Advertiser. Honolulu, Hawaii. UPI. p. 1. Retrieved March 20, 2019 – via Newspapers.com. ^ "Apollo 11 Crew Starts World Tour". Logan Daily News. Logan, Ohio. Associated Press. September 29, 1969. p. 1. Retrieved March 20, 2019 – via Newspapers.com. ^ "Japan's Sato Gives Medals to Apollo Crew". Los Angeles Times. Los Angeles, California. November 5, 1969. p. 20. Retrieved March 20, 2019 – via Newspapers.com. ^ Collins 2001, pp. 454–455. ^ Lee 2007, pp. 184–186. ^ a b c Lee 2007, p. 188. ^ Lee 2007, p. 187. ^ "Michael Collins". National Air and Space Museum. Retrieved March 26, 2019. ^ Lee 2007, p. 189. ^ "Michael Collins – People – Department History – Office of the Historian". United States Department of States. Archived from the original on December 18, 2018. Retrieved December 18, 2018. ^ "Eyes of Nepalese". The Pittsburgh Press. Pittsburgh, Pennsylvania. November 27, 1973. p. 17. Archived from the original on October 8, 2018. Retrieved October 8, 2018 – via Newspapers.com. ^ "Caroline Clendening Laise – People – Department History – Office of the Historian". United States Department of States. Archived from the original on December 18, 2018. Retrieved December 18, 2018. ^ Harwit 1996, p. 14. ^ Harwit 1996, p. 15. ^ Roland 1993, p. 84. ^ Roland 1993, p. 85. ^ Roland 1993, pp. 86–87. ^ "NASM Construction Appropriation Approved". Smithsonian Institution. Retrieved March 13, 2017. ^ Neibauer, Michael (June 30, 2015). "The National Air and Space Museum is falling apart. We've got the details on the $365M fix". Washington Business Journal. Retrieved January 19, 2019. ^ a b c St. Thomas, Linda (July 1976). "NASM Set to Launch July 1" (PDF). The Smithsonian Torch. Retrieved January 19, 2019. ^ a b "National Air and Space Museum". Gilbane. Retrieved January 19, 2019. ^ "Ground is Broken for NASM". Smithsonian Institution. Retrieved March 13, 2017. ^ "History". National Air and Space Museum. June 23, 2016. Retrieved January 19, 2019. ^ "Museum in DC". National Air and Space Museum. May 3, 2016. Archived from the original on July 6, 2016. Retrieved March 13, 2017. ^ Harwit 1996, pp. 20–21. ^ "National Air and Space Museum, Office of the Director – Agency History". Smithsonian Institution. August 29, 2002. Archived from the original on February 8, 2012. Retrieved April 16, 2015. ^ a b Congressional Gold Medal to Astronauts Neil A. Armstrong, Buzz Aldrin, and Michael Collins. 2000 Congressional Record, Vol. 146, Page H4714 (June 20, 2000). Retrieved April 16, 2015. ^ Hines, Jessica (August 3, 2010). "More than an astronaut; an American Airman". Archived from the original on December 21, 2018. Retrieved December 21, 2018. ^ a b c "A Guide to the Michael Collins Papers, 1907–2004 Collins, Michael Papers Ms1989-029". Virginia Heritage. Archived from the original on June 26, 2018. Retrieved December 21, 2018. ^ a b Wilford, John Noble (July 17, 1994). "The Health Care Debate: The Astronauts". The New York Times. Archived from the original on April 27, 2018. Retrieved April 27, 2018. ^ "Michael Collins Interview". STEM in 30. Interviewed by Beth Wilson. Smithsonian National Air and Space Museum – via YouTube. ^ "Michael Collins". Astronaut Central. Archived from the original on January 4, 2006. Retrieved April 11, 2018. ^ Marquard, Bryan (May 4, 2014). "Patricia Collins, 83; wrote about being an astronaut's wife". The Boston Globe. Archived from the original on November 27, 2015. Retrieved November 26, 2015. ^ a b "Biographical Data" (PDF). NASA. Retrieved February 28, 2018. ^ "Fellow Classes". SETP. Archived from the original on March 6, 2018. Retrieved May 2, 2018. ^ Sprekelmeyer, Linda, ed. (2006). These we honor: the International Aerospace Hall of Fame. International Aerospace Hall of Fame. San Diego, California: Donning Co. Publishers. ISBN 9781578643974. ^ "Space Hall Honors Pioneers". Las Cruces Sun-News. Las Cruces, New Mexico. October 30, 1977. p. 6. Retrieved March 20, 2019 – via Newspapers.com. ^ "2008 Honorees". City of Lancaster. Archived from the original on March 2, 2018. Retrieved March 1, 2018. ^ "Piloted the command module on Apollo 11, the first manned moon-landing mission". New Mexico Museum of Space History. Archived from the original on October 22, 2017. Retrieved February 28, 2018. ^ Gaherty, Geoff (April 19, 2013). "How to See Where Astronauts Walked on the Moon". Space.com. Archived from the original on March 4, 2018. Retrieved March 3, 2018. ^ "Michael Collins". The Hall of Valor Project. Archived from the original on April 24, 2018. Retrieved April 23, 2018. ^ "Whoosh to Altitude Record 'Tremendous Thrill' to Astros". Independent. Long Beach, California. UPI. August 2, 1966. p. 14. Archived from the original on April 25, 2018. Retrieved April 25, 2018 – via Newspapers.com. ^ "Michael Collins – Recipient". Military Times Hall of Valor. Archived from the original on December 21, 2018. Retrieved December 21, 2018. ^ ""Three Very Brave Men" Given Presidential Toast and Medals". The Gastonia Gazette. Gastonia, North Carolina. Associated Press. August 14, 1969. p. 1. Archived from the original on April 23, 2018. Retrieved April 23, 2018 – via Newspapers.com. ^ "The Gen. Thomas D. White USAF Space Trophy" (PDF). USAF. May 1997. p. 156. Retrieved March 20, 2019. ^ "Collier 1960–1969 Recipients". National Aeronautic Association. Archived from the original on August 25, 2018. Retrieved March 1, 2018. ^ "Apollo 11 Honor". The Burlington Free Press. Burlington, Vermont. May 7, 1970. p. 3. Archived from the original on April 26, 2018. Retrieved April 26, 2018 – via Newspapers.com. ^ "Two R.A.F. Pilots to Share Harmon Aviator's Trophy". The New York Times. September 7, 1970. Archived from the original on January 5, 2018. Retrieved March 3, 2018. ^ "Apollo 11 Astronauts Add Harmon Trophy to Collection". The Montgomery Advertiser. Montgomery, Alabama. Associated Press. September 6, 1970. p. 52. Archived from the original on April 25, 2018. Retrieved April 24, 2018 – via Newspapers.com. ^ "3 Astronauts get Harmon Trophies". The Times. Shreveport, Louisiana. Associated Press. May 20, 1971. p. 20. Archived from the original on April 25, 2018. Retrieved April 24, 2018 – via Newspapers.com. ^ "Agnew Gives Medals to Apollo 11 Crew". The La Crosse Tribune. La Crosse, Wisconsin. Associated Press. February 18, 1970. p. 6. Archived from the original on April 27, 2018. Retrieved April 27, 2018 – via Newspapers.com. ^ "Collins, Michael". National Aviation Hall of Fame. Archived from the original on March 19, 2018. Retrieved February 28, 2018. ^ "Iven C. Kincheloe Recipients". Society of Experimental Test Pilots. Archived from the original on August 1, 2018. Retrieved February 28, 2018. ^ Boyle, Alan (July 20, 1999). "Moon Anniversary Celebrated". NBC News. Archived from the original on March 4, 2018. Retrieved March 3, 2018. ^ "Apollo 11 astronauts honored for 'astonishing' mission". CNN. July 20, 1999. Archived from the original on February 8, 2018. Retrieved April 24, 2018. ^ "NASA Legends Awarded Congressional Gold Medal". NASA. November 16, 2011. Archived from the original on May 19, 2017. Retrieved April 25, 2018. ^ Schwartz, John (September 4, 2007). "Film Takes Us Back 38 Years, to That First Walk". The New York Times. Archived from the original on August 2, 2018. Retrieved August 1, 2018. ^ Vancher, Barbara (January 8, 2010). "Michael Cera hopes that movie captures the heart of the book". Pittsburgh Post-Gazette. Archived from the original on January 12, 2010. Retrieved July 3, 2010. ...astronaut Michael Collins filmed a bit part as a man selling a broken-down trailer. ^ King, Susan (November 17, 1996). "Moon Over 'Apollo 11'". The Los Angeles Times. p. 433. Archived from the original on April 30, 2018. Retrieved April 30, 2018 – via Newspapers.com. ^ James, Caryn (April 3, 1998). "Television Review; Boyish Eyes on the Moon". The New York Times. Archived from the original on August 6, 2018. Retrieved August 5, 2018. ^ Marill, Alvin H. (October 11, 2010). Movies Made for Television: 2005–2009. Lanham, Maryland: Scarecrow Press. p. 66. ^ "Ryan Gosling's Neil Armstrong movie to open Venice Film Festival". BBC. July 19, 2018. Archived from the original on August 2, 2018. Retrieved August 2, 2018. ^ Sandell, Scott (March 1, 2010). "Apollo Landing – Hollywood Star Walk". Los Angeles Times. Archived from the original on November 20, 2018. Retrieved November 20, 2018. ^ Eder, Bruce. "Jethro Tull – Benefit review". AllMusic. All Media Network. Archived from the original on May 4, 2018. Retrieved May 3, 2018. ^ Cox, Jamieson (April 25, 2013). "The Boy Least Likely To". Pitchfork. Archived from the original on June 27, 2018. Retrieved August 5, 2018. ^ "Beats Per MinuteAlbum Review: The Boy Least Likely To – The Great Perhaps – Beats Per Minute". Beats Per Minute. Archived from the original on November 13, 2014. Retrieved July 17, 2014. ^ Moring, JT (April 2017). "John Craigie: Millennial Storyteller". San Diego Troubadour. Retrieved April 17, 2018. Barbree, Jay (July 8, 2014). Neil Armstrong: A Life of Flight. Sydney, New South Wales: Pan. ISBN 978-1-74354-065-7. OCLC 927462570. Benson, Charles D.; Faherty, William B. (1978). Moonport: A History of Apollo Launch Facilities and Operations (PDF). Washington, D.C.: NASA. OCLC 47194250. SP-4204. Retrieved September 22, 2018. Bilstein, Roger E. (1980). Stages to Saturn: A Technological History of the Apollo/Saturn Launch Vehicle (PDF). NASA History Series. Washington, D.C.: NASA. OCLC 36332191. SP-4206. Retrieved September 19, 2018. Collins, Michael; Aldrin, Edwin E., Jr. (1975). "The Eagle Has Landed". In Cortright, Edgar M (ed.). Apollo Expeditions to the Moon. Washington, D.C.: NASA. pp. 203–224. OCLC 1623434. SP-350. Retrieved June 13, 2013. Collins, Michael (2001) . Carrying the Fire: An Astronaut's Journeys. New York: Cooper Square Press. ISBN 978-0-8154-1028-7. OCLC 45755963. Cullum, George W. (1940). Biographical Register of the Officers and Graduates of the US Military Academy at West Point New York Since Its Establishment in 1802: Supplement Volume VIII 1930–1940. Chicago: R. R. Donnelly and Sons, The Lakeside Press. Retrieved October 6, 2015. Cullum, George W. (1950). Biographical Register of the Officers and Graduates of the US Military Academy at West Point New York Since Its Establishment in 1802: Supplement Volume IX 1940–1950. Chicago: R. R. Donnelly and Sons, The Lakeside Press. Retrieved October 6, 2015. Cullum, George W. (1960). Biographical Register of the Officers and Graduates of the US Military Academy at West Point New York Since Its Establishment in 1802: Supplement Volume X 1950–1960. West Point, New York: West Point Alumni Foundation. Evans, Ben (2010). Foothold in the Heavens: The Seventies. New York: Springer Praxis. doi:10.1007/987-1-4419-6342-0. ISBN 978-1-4419-6342-0. OCLC 668096065. Gawdiak, Ihor; Fedor, Helen (1994). NASA Historical Databook, Volume IV: NASA Resources 1969–1978 (PDF). Washington, D.C.: NASA. SP-4012. Retrieved November 6, 2018. Hacker, Barton C.; Grimwood, James M. (2010) . On the Shoulders of Titans: A History of Project Gemini (PDF). NASA History Series. Washington, D.C.: NASA History Division, Office of Policy and Plans. ISBN 978-0-16-067157-9. OCLC 945144787. NASA SP-4203. Retrieved April 8, 2018. Hansen, James (2005). First Man: The Life of Neil Armstrong. New York: Simon & Schuster. ISBN 978-0-7432-5631-5. OCLC 937302502. Harwit, Martin (1996). An Exhibit Denied: Lobbying the History of Enola Gay. New York: Copernicus. ISBN 978-0-387-94797-6. OCLC 489580309. Lee, Mordecai (2007). "The Astronaut and Foggy Bottom PR: Assistant Secretary of State for Public Affairs Michael Collins, 1969–1971". Public Relations Review. 33 (2): 184–190. CiteSeerX 10.1.1.613.9312. doi:10.1016/j.pubrev.2006.11.004. ISSN 0363-8111. Manned Spacecraft Center (November 1969). Apollo 11 Mission Report (PDF). Houston, Texas: NASA. OCLC 10970862. SP-238. Retrieved July 10, 2013. Orloff, Richard W. (2000). Apollo by the Numbers: A Statistical Reference. NASA History Series. Washington, D.C.: NASA History Division, Office of Policy and Plans. ISBN 978-0-16-050631-4. LCCN 00061677. OCLC 829406439. SP-4029. Retrieved June 12, 2013. Reichl, Eugen (2016). Project Gemini. Atglen, Pennsylvania: Schiffer. ISBN 978-0-7643-5070-2. OCLC 1026725515. Roland, Alex (1993). "Celebration or Education? The Goals of the U.S. National Air and Space Museum". History and Technology. 10 (1): 77–89. doi:10.1080/07341519308581837. Shayler, David J.; Burgess, Colin (2017). The Last of NASA's Original Pilot Astronauts. Chichester: Springer-Praxis. doi:10.1007/978-3-319-51014-9. ISBN 978-3-319-51012-5. OCLC 1023142024. Shayler, David J. (2004). Walking in Space. London: Springer-Praxis. doi:10.1007/978-3-319-51014-9. ISBN 978-1-852-33710-0. OCLC 249000768. Sherrod, Robert (1975). "Men for the Moon". In Cortright, Edgar M (ed.). Apollo Expeditions to the Moon. Washington, D.C.: NASA. pp. 143–166. OCLC 1623434. SP-350. Retrieved June 13, 2013. Slayton, Donald K.; Cassutt, Michael (1994). Deke! U.S. Manned Space: From Mercury to the Shuttle. New York: Forge Book. ISBN 978-0-312-85503-1. OCLC 29845663. Uusma, Bea (2003). The Man Who Went to the Far Side of the Moon: The Story of Apollo 11 Astronaut Michael Collins. Carmel, California: Hampton-Brown. ISBN 978-0-7362-2789-6. Michael Collins, David Mindell (April 1, 2015). Apollo 11's Michael Collins visits MIT/AeroAstro. Massachusetts Institute of Technology. Retrieved November 26, 2015.